Xenon headlamps are a fairly new method of producing light that offer several benefits over halogen headlamps. Xenons are also known as Xenon-HID or HIDs meaning High Intensity Discharge and the term bi-xenon may be used to describe the xenon technology being used for both the high and low beam. The xenon bulb is made of quartz glass which is filled with xenon gas sometimes called ionised noble gas under high pressure. There are two tungsten electrodes inside the bulb and the electricity forms an arc when it passes through them and that process is what forms the light and the arc continues jumping through the electrodes as long as the headlamps are on. Xenon headlamps do not use any glowing filament to direct or reflect the light. The bulb is round sort of like half of an small almost transparent ball and is inside of the entire headlamp usually as part of the headlights. The headlamps on a vehicle may also use halogens and/or LED lights along with the xenon bulb. Xenon headlights use less energy during operation. They require a high voltage to start the first arc and a low voltage is used to keep the headlamps lighting. This ultimately results in the bulbs using less energy especially when the headlights are used for long periods. Xenon headlamps also last much longer than halogen headlamps and can remain working through out the life of the vehicle which is another advantage of these lights. The xenon lights are also brighter and clearer than halogens and their bluish colour is much closer to daylight which offers better visibility during bad weather, in the night and low light driving conditions. 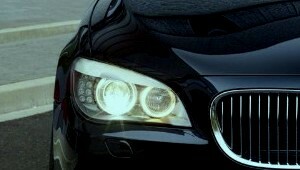 The headlamps themselves add a luxurious and expensive look to the front of the vehicle even when they're off. The structure of the xenon bulb allows it to move easily with the aid of an electric motor if thats the desire of the manufacturer so adaptive/self levelling headlamps can be easily incorporated into the vehicle when xenons are used. Hi and low beams are achieved via a screen that can block part of the light in the bulb or can adjust itself to reveal more light whenever the high beam is selected by the driver or if the vehicle selects it for hi beam assist. BMW introduced xenon headlamps on their 7 Series back in 2003 and they are now widely used throughout the automotive industry. There are even imitators as not all bluish coloured lights you see emanating from headlamps are the high intensity discharge technology but merely a strip over the lens to give the bluish effect.